Ah yes, pillowcases. I'm sure that every embroidery machine owner does pillowcases. ;-) In my case, at this time, I didn't have a whole lot of designs, free or purchased, and I didn't want to commit myself to decorating a garment that would actually be seen by the general public! Pillowcases seemed to be the perfect project to experiment and try my brand-new embroidery skills on. The pink one was my 2nd attempt and I was trying to put horizotal motifs on the pillow case band. Although the design isn't as lush as the white pillow case design, I'm pleased with the outcome. 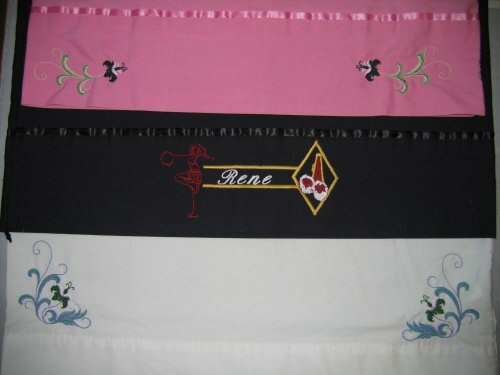 The pink pillowcase designs came from ABC Embroidery Designs. However, I'm fairly certain that I got these particular designs from eBay; I don't find them listed on their website. The black one was my 3rd attempt. I combined 2 designs for this one ... the outline of the cheerleader was one design and the motif with the horizontal lines & diamond was the other. I added in my daughter's name between the horizontal lines. Unfortunately, I didn't keep track of where I got the cheerleader designs from. They both came in zip files but no informational text file was included. All I can tell you is that the cheerleader design is called "spg414_small.jef" and the diamond with pom-poms and horizontal lines is called "spg295.jef". Good luck in your search if you want them! The white one was my first attempt at using a corner design. You can see that I hadn't quite mastered the skill of putting both designs on the same horizontal line. The white pillow case also came from the same set as the ones used on the pink pillowcase.